Why are we still using FTP? If you are using a shared host like GoDaddy, Asmallorange etc. they have limited options when it comes to uploading your code to their servers. Most will provide only FTP access. 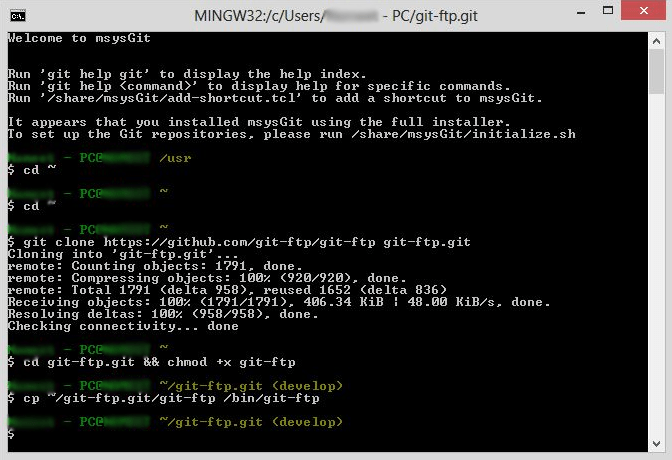 If you are using Git (or GitHub) for your development purpose, it becomes a huge inconvenience to use an FTP client to upload the files manually. If you have a large set of files, then you also need to manually upload only the changed files. With this solution, you will not need to use an FTP client. Begin with downloading msysgit for Windows. At the time of writing this, the latest file is “msysGit-fullinstall-1.8.4-preview20130916.exe”. Click on the link below to download. When prompted, extract to “c:\” and this will create a “c:\msysgit” folder. It may take a while to download and install. 2. This will load a standard command prompt. Go to your working folder (which you want to synchronize) [must be git repo]. Do let me know your suggestions on how I can improve this tutorial. If you like what you are reading, then please help spread the word by re-tweeting, blogging and sharing this tutorial. Thank you. The problem is alot of companies are still using ftp to upload all their projects to their servers and what that does is allow all the employees to know all the clients ftp passwords so when a person is let go either all ftp credentials have to change or sometimes they dont and there is mass chaos. Its a lot safer to just use git for all projects that way if a person is let go only their account has to be disabled. This won’t work always if the client does not have a dedicated server. Most shared hosts only provide FTP. nice tool and clear tutorial, but how can I pull from FTP? [1 of 720] Buffered for upload ‘.gitignore’. [2 of 720] Buffered for upload ‘wp-config-sample.php’. [24 of 720] Buffered for upload ‘wp-content/plugins/woocommerce/admin/post-types/writepanels/order-item-html.php’. and then try again. it should work now! I have the same problem as Permana, anyone have any suggestions??? Thanks for this post. I’m going to try out the git-ftp. If some automation could be introduced somehow using hooks, it would be awesome. PERFECT! The work this tutorial has saved me, much appreciated. Thanks. Try to add commit, then git ftp init. I know its way to old but when i search for this issue; this post was number one. In my case i deleted a file from my repo and i havent yet commited it. Which was the reason for this dirty message. After i checked out the file; it worked for me. git ftp init is too aggressive. I don’t know how it works, but I just deleted line 28 in git-ftp file. I haven’t any error now.